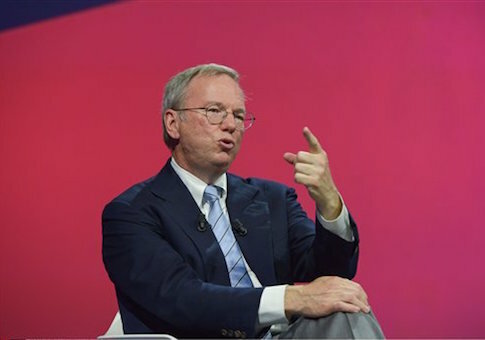 Eric Schmidt, the chief executive of Alphabet, Google's parent company, has helped raise tens of millions for a Democratic data firm comprised of Obama campaign alumni. Civis Analytics, a consulting firm founded by Dan Wagner, the chief analytics officer for President Obama's 2012 presidential campaign, pulled in $22 million in its latest round of funding, TechCrunch reported. Civis Analytics was "born" out of the Obama campaign, which Schmidt worked for as a trainer and recruiter. The firm still employs many of the same players that worked on the campaign. Schmidt initially approached Wagner about starting a company at the conclusion of the 2012 election cycle. Schmidt, a partial owner of the company, provided Civis with millions in funding in 2013. Civis is now on the payroll of numerous Democratic and progressive organizations, including the Democratic National Committee (DNC), Democratic Senatorial Campaign Committee (DSCC), NextGen Climate Action Committee, a PAC founded by liberal billionaire environmentalist Tom Steyer, and the Senate Majority PAC, which is the political action arm of Sen. Harry Reid (D., Nev.). Civis Analytics pulled in more than $2.4 million from Democratic groups in 2015 and 2016, according to filings with the Federal Election Commission. It lists Airbnb, Boeing Company, Discovery, and the Bill and Melinda Gates Foundation as clients. Schmidt has backed other Democratic firms. He also helped bankroll a company that was used by Hillary Clinton's unsuccessful 2016 presidential campaign. It was revealed that Schmidt worked directly with the Clinton campaign following WikiLeaks' release of emails from the account of Clinton campaign manager John Podesta. It is believed the Russian government hacked the emails to influence the outcome of the presidential election. Teddy Goff, a digital strategist for the Clinton campaign and digital director for the Obama reelection campaign, mentioned the election work being performed by Schmidt's group in an internal memo attached to an email about Hillary for America's technology and digital priorities. The Schmidt-backed group was not mentioned by name in the memo. However, Michael Slaby, the former chief integration and innovation officer of the Obama campaign, developed a tech startup called The Groundwork through a company he cofounded called Timshel. The group was funded by Schmidt and paid $600,000 by Clinton's campaign during the election. Google’s search engine came under fire earlier this year for allegedly manipulating search results in favor of Clinton and against Donald Trump. Schmidt claimed at the time that Google did not support any particular candidate. "We have not taken a position on the American election and nor do I expect us to," Schmidt said. Schmidt was photographed wearing a "staff" badge at a Clinton election night gathering. Schmidt did not immediately return a request for comment on his latest round of funding for Civis Analytics. This entry was posted in Politics and tagged Democratic Party, Google. Bookmark the permalink.